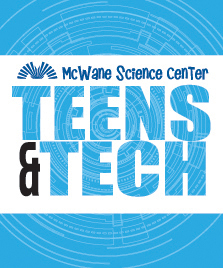 Our next Teens and Tech event will be on Saturday March 5th from 5:00pm-9:00pm. This event will be centered around our travelling exhibition “Body Worlds Rx.” This exhibit uses real human specimens to show the details of today’s common diseases and the inner workings of our anatomy. You can learn more about the exhibit here. Participants will have an opportunity to tour the exhibit (scavenger hunt style), design biomechanical mechanisms and meet scientist who design medical devices. This event is for any 6th-12th grader, and dinner is provided. Younger siblings may not attend. Our parking deck will be open for pick up and drop off. You may enter the special events entrance on level C.
This event is FREE for any 6th – 12th graders to attend and dinner is provided! Seating is limited. To reserve a spot, please contact our Reservations Department at (205) 714-8414.